I know it is difficult to believe that Pst Chris is an agent of darkness.He was called and gifted but backslided through his association with tb joshua. He has the gifts because the gifts and the callings of God are without repentance.But he knows that his soul is doomed. If you have listened to his messages and you are a christian you will find a lot of heresies in them.He said deliverance is irrelevant,he said the Lord's prayer is not necessary,He said that the blood is not relevant today,he does not preach against sin and makes his members to feel free committing sin.A member once told me that if you fornicate all you need to do is to speak in tongues and it is forgotten.Now he has said m.asturbation is not a sin against God. His members hardly read their bible for themselves,they read his books and rhapsody which is most times filled with heresies. M.asturbation is a product of lust,is lust not a sin? Jesus said fornication is looking at somebody lustfully. Please i am not judging a man of God,but Pst Chris is not a man of God,he was a man of God before but not anymore. God does not supply him with money,he deceives his members into compulsory partnership and gives them awards to motivate them.Christ embassy is not a church it is a company.A company of sinners who dont know that they are committing sin. A female pastor came for the pastors and partners conference with a Love Machine.Since she feels m.asturbation is not a sin,so she is ok with it. Nobody is yet perfect not even me,but the bible has a stand on this issue.You may insult me,but you cannot deny the fact that pastor chris is preaching heresies. Joe Agbaje,dont you know that you will judge angels,why can't you judge this issue.Are you blind as a christian? God is weeping as Christian's keep quite and believe nonsense.Why do you think he does not invite any other minister to preach neither does he go to other churches.He is on his own because of his false beliefs. Tongues are good,but tongues does not guarantee heaven.Most christ embassy members speak demonic tongues. As for tb joshua,he may use the name of Jesus Christ,but he is not speaking it in faith but deceitfully.Someone once said can a demon cast out a demon,why not.The devil put the demon there so he can cast them out just to deceive christians.And do you think the demons are really leaving, they are just keeping quiet. In conclusion, the aim of tb joshua and pastor chris is to make christians backslide and make them feel they are doing the right thing because they give wrongly and speak in tongues. 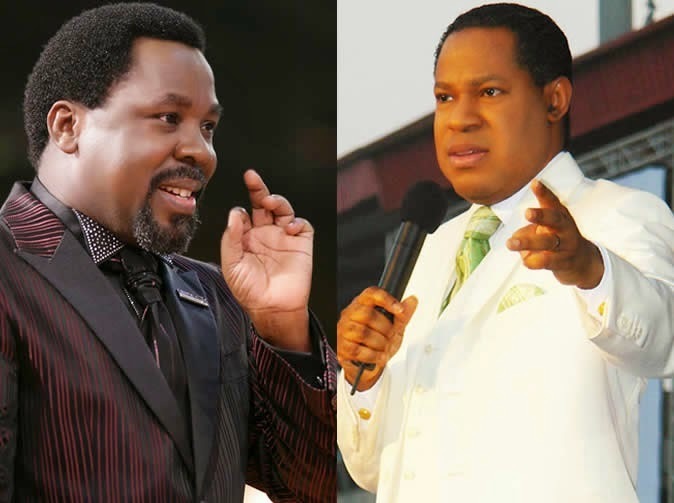 No church or pastor is perfect but pst chris and tb joshua are voluntary agents of the devil,they know what they are doing and are going to do more.Matthew 24:24.